Lauren Nicole Coppin – Campbell, West London, 19, journalism undergraduate and part-time personal shopper. For years, I’ve suffered from body dysmorphia – even when I wasn’t plus-size, I loathed my body. At 13, I didn’t want to leave the house, because I thought I was disgusting and others would laugh at me. I distinctively remember, one day my mum told me to go to our local Sainsbury’s, it’s about 5 minutes away from my house on the bus. For the whole bus journey, I cried because I felt like everyone was looking at me and laughing. My love for performing arts was ruined by my hatred for my appearance. I couldn’t bear the idea of joining a drama club because I was “too fat”, or “too ugly”. By 15, I wasn’t treating my body with respect it deserved; binge-eating and forcing myself to be sick, in the hopes to look “perfect”, and “beautiful”. By the time, I reached 18; I had had enough. There’s only so much fighting you can do with yourself. On my 18th birthday, I promised myself this year would be different. 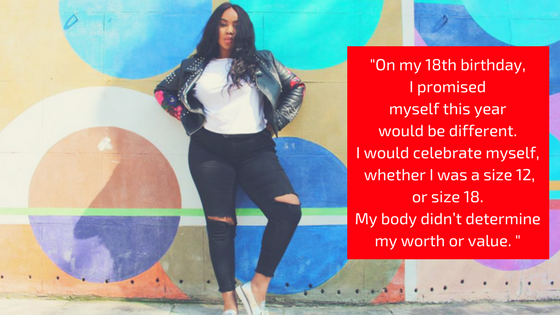 I would celebrate myself, whether I was a size 12, or size 18. My body didn’t determine my worth or value. My origins are in the Caribbean, Barbados and Jamaica to be specific, and a lot of my family still live out there. When I was younger, I would visit my father’s child home, where my grandmother and great grandmother lived. My paternal great grandmother’s eyes weren’t very good, so every time I went to see her, she would examine how I looked checking how small my wrists were. As a child, who was perfectly average and normal, I was told: “you’re so fat”. I also developed a lot quicker than my friends. In year 5, I was having my period, wearing a bra and had body hair. With all of that came hips and a bottom; far wider and bigger than any of my friends. While I was never “bullied”, I constantly felt out of place, and the few times I was called a name “sumo wrestler”, further anchored my issues. I ask myself this question a lot, and I’m honestly not sure. 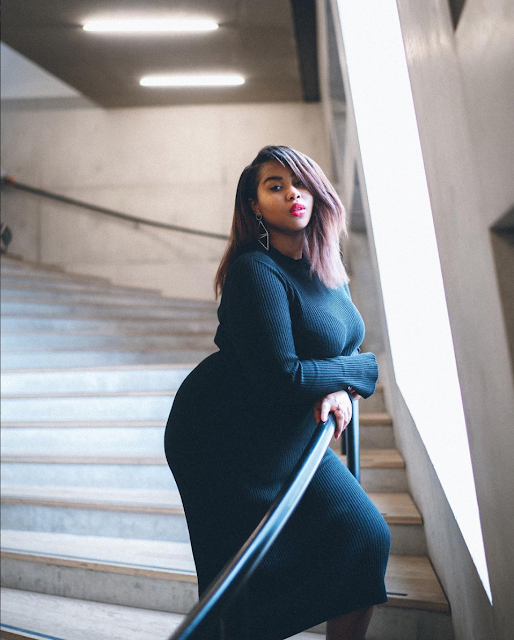 I was found on Instagram by a brand, who then appointed me as their brand ambassador, with that came the chance to model alongside Felicity Hayward (another plus size model I looked up to and celebrated). If I’m honest, the fact that they thought I had a chance of being good at it drove my ambition to continue modelling, whether that was for their brand or another. I think it’s a great thing. While I’ve been a size 14 for most of my teenage years, I never felt represented, especially as my weight flocculated. It was only until I discovered Nadia Aboulhosn, Gabi Gregg aka GabiFresh, and Tess Holiday that I began to accept my body. I do think, we have a long way to go, the average “plus size” model seen in fashion campaigns is a size 12-14, and if she’s over a size 14, she’s incredibly toned, with a flat stomach. While I have nothing against that; I think those women are beautiful and so happy to see their body shape represented, I would love to see women that are a size 18 and plus. So, let’s celebrate the likes of Iskra Lawrence, Bree Warren and Ashley Graham, but also see more models like Olivia Campbell, Tess Holiday, Felicity Hayward, my beautiful friend Chanelle Mustafa and I. Have you faced any difficulties being a Curve / plus-size model? 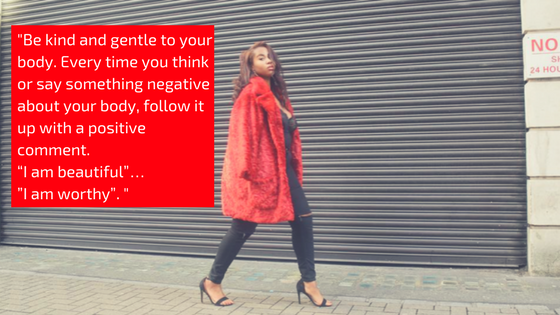 When I first started, I was told I was too small (I was a size 16) – which I subconsciously took on. After getting signed, no one said I’m too big, but I do often feel it. Recently, I was sent an email for a casting for a major high street brand. The casting was for curve models, who are a size 18. But in the notes from the brand, it read “it is advisable to take padding with you as they shoot on sample size 18”. The idea that I was up against other beautiful and talented models my size was enough, but also to compete with girls that are a size 14, but can wear padding to make themselves a size 18, was sickening. 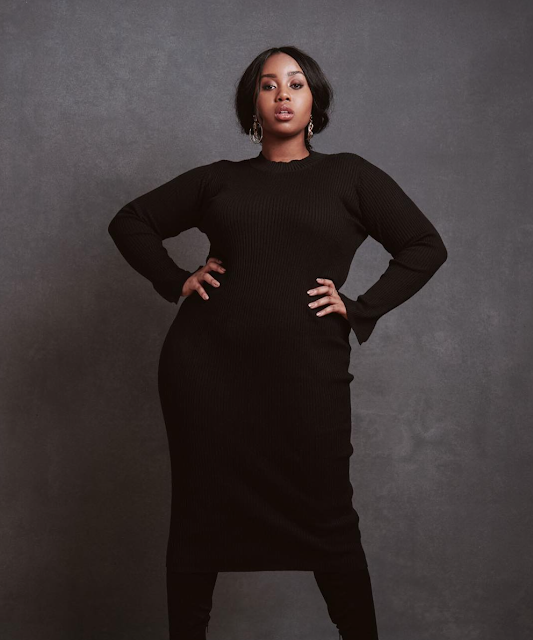 As a plus size consumer but also a model, I want to shop from retailers who show their clothes on plus size models, not smaller women who have padded themselves up. There is still a preferred body type for curve models, which tends to be hour glass, has this pressured you to try and change your body in any way? It could be argued I fit into that preferred body type, as I have an hourglass figure, and I recognise that. However, my body is not toned whatsoever, and my stomach is not flat. Of course, I often wish my body shape fitted the mould more, and wonder if that would get me more bookings. But then I remember just how important it is that I represent the bodies of women like me. I’m an ASOS and Zara girl. Almost everything in my wardrobe is either ASOS or Zara; my bags and accessories are predominately from Zara. My eyes…followed by my lips. I’ve always preferred the top half of my body to the bottom half. I love the history of my ethnic features. Be kind and gentle to your body. Every time you think or say something negative about your body, follow it up with a positive comment. “I am beautiful”…”I am worthy”. Your art is not about how many people like your workyour art is about if your heart likes your work if your soul likes your workit's about how honest you are with yourself and youmust never trade honestyfor reliability - Rupi Kaur, my favourite poet. I’m still working on that. I don’t have a particular way of “celebrating my body”, other than reaffirming how great and beautiful I am every time I think of something negative. 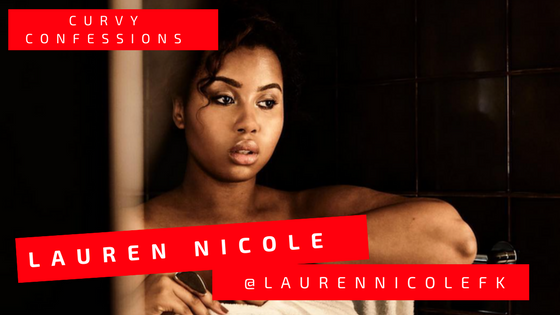 I would like to thank Lauren Nicole for being a part of my Curvy Confessions series and for being so open and sharing your journey with us. I know there is a woman reading this who you may have encouraged to love herself just that little bit more!! !